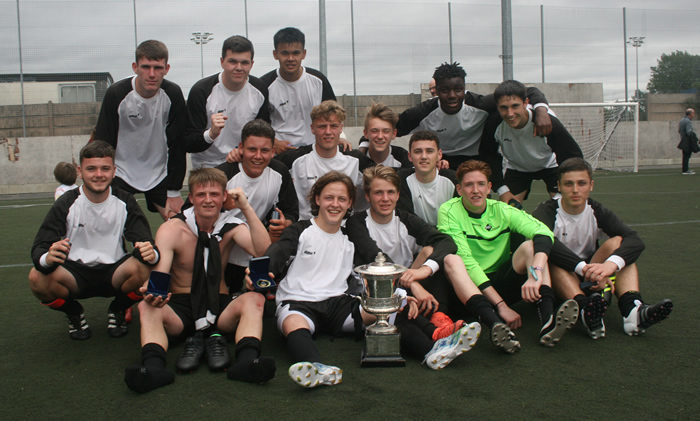 Chester & District FA Youth Team ended a 27 year wait to win the Cheshire FA District Youth Cup on Saturday 15 July 2017 beating Crewe & District FA 4-2. The Cheshire FA District Youth Cup is open to the nine District FA's in Cheshire. It started in 1949 and Chester & District FA have previously won it in 1957 and 1990, but, missed out twice recent years in the final. Crewe FA started the game the better of the two teams gaining an early goal after 7 minutes and Chester FA were unlucky to concede another goal on 23 minutes via a deflection off a Chester player. The 2-0 advantage to Crewe FA did not last long after the half-time break with Harley Bennion scoring after 55 minutes and adding another within 2 minutes to equal the scores. With Chester FA playing the better football and creating more chances an important third goal was scored by Edward Jones on 63 minutes before Harley completed his hat-trick on 74 minutes. The final whistle earned Chester FA a hard fought victory over a very competitive and skilful Crewe team whom were the previous holders, that the Chester side coached by Martin Dean were more than a match for. This competition has resulted in a number of the Chester FA players being invited to the Cheshire FA County Youth Team trials. Tonight we rightly and justly recognise the achievements of a lady who has been the corner-stone of grassroots football at Vicars Cross Dynamos for 25 years. Dedicated, friendly, hard-working and trust-worthy are a few words which would aptly sum up Diane’s character. 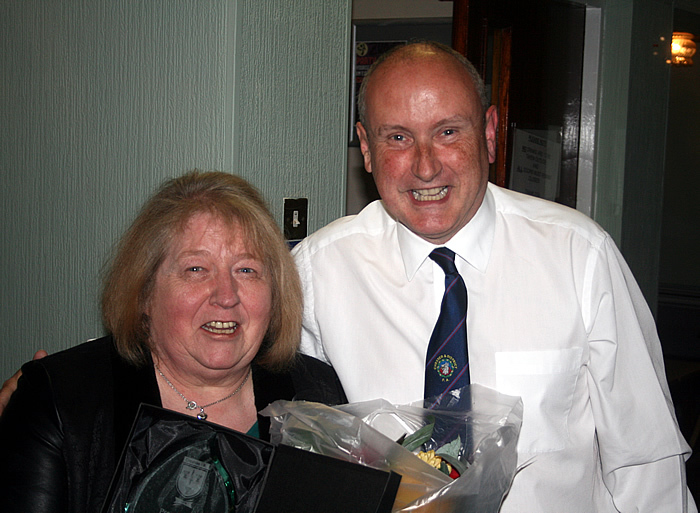 I have only come into contact with her during these last two seasons but I am pleased that I have been given the opportunity to know somebody who embodies everything that is good about the volunteer work-force that keeps grassroots football alive and well. But to have done that task with such commitment over 25 years is truly remarkable and is an achievement not many people can emulate. Diane was at the club when it started with 3 teams and she has been Secretary at the Club during the tenure of 5 Chairmen. One of those ex-Chairmen told me that he would always be indebted to Diane for her help and support. I am sure that those sentiments will be echoed by other Chairmen. Vicars Cross Dynamos was quick off the mark to gain FA Charter Standard Development Club status and Diane was at the forefront of that process ensuring that Vicars Cross Dynamos was the first Chester club to gain this status. Gaining this status fundamentally changed the number of teams significantly and at one point included 10 Junior teams, an U18 Youth side, a Senior Men’s team and 3 girls’ teams. Every year the highlight of the close season was the annual competition organised by Vicars Cross Dynamos and anybody involved in arranging competitions will understand the considerable effort required for it to be a success. She has been at the heart of organising 18 mini soccer tournaments, from getting the teams entered, to getting the food, First aiders, traffic cones, rubbish collection and all to arrive on the day, then spending a full 2 days in the kitchen. The tournaments wouldn't have happened without her! But the time has come for Diane to let others take the reins at the club. She has set a very high standard and the length of service rightly receives recognition tonight before her peers. Thank you for your contribution to grassroots football in Chester. Bob as he is known to us all in refereeing circles started his involvement with refereeing some 50 years ago. He qualified as a referee in January 1966 via the RAF FA before commencing his referee career in Chester for season 1966-67. He was promoted to a Class 1 referee in season 1971-72 and officiating thereafter on the West Cheshire League, West Midlands Inter-Service League, Cheshire County League and North West Counties League. He was promoted to the Linesman’s List of the Football League in 1978 and remained at that level until 1987. During this period Bob refereed the Cheshire FA Senior Cup Final (1983) as well undertaking international duties as Linesman in a European Cup Quarter Final tie (1984). He completed his domestic senior career when he refereed the North West Counties League Cup Final (1987) having the previous year been Linesman on the Football League Milk Cup Semi-Final. When Bob ended his senior career local football was to gain from his wealth of experience. From 1988 onwards he returned to referee in the local leagues and in Schools football. However, Bob also became a referee assessor for the Football League and other Leagues as well as Cheshire FA, a role which he undertakes with the County FA to the present day. 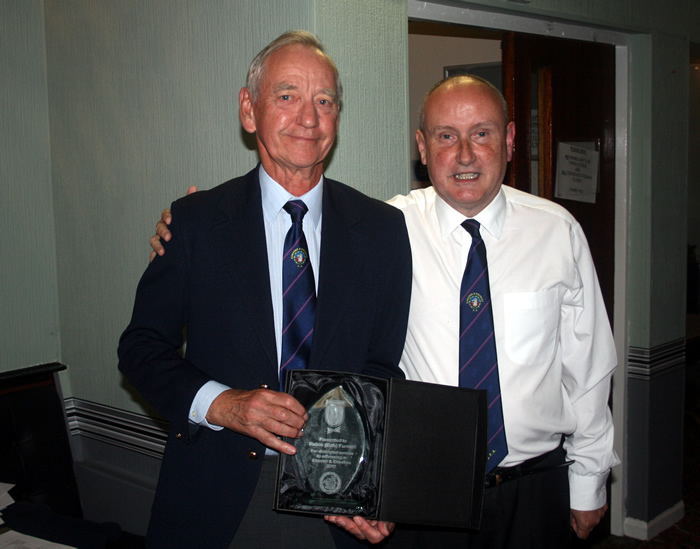 Bob, as many will know has influenced the progress of many Chester referees and has been present at the outset of their careers as a Referee Coach. He became an FA Licensed Referees Instructor (1989) and became a member of the FA Tutor’s Club in 2008. He also qualified as an FA Referee Mentor and until 2014 was an FA Licensed Safeguarding Tutor. A roll of honour of which he should be justly proud and we in Chester have had the privilege of being part of that journey.